Mesothelioma and its cancer treatments can cause dietary side effects such as a sore throat, lack of appetite and dry mouth. These affect nutrition and recovery because they make eating difficult. You may need to change your diet to stay healthy and strong enough to tolerate the side effects of the mesothelioma and its treatments. For example, not consuming enough calories and protein because treatment-related mouth sores are preventing you from eating is a common challenge for cancer patients. Without good nutrition, you may struggle to keep up your weight before, during and after treatment. It is important to address this nutritional issue head on to ensure you receive all your treatments and recover. Dietary side effects vary from person to person based on their unique diagnosis, treatments, overall health and other factors. However, there are some dietary side effects unique to patients with mesothelioma. Fluid can build up in your midsection can compress your digestive tract. This may prevent your body from sending normal hunger cues. When this happens, you never feel hungry. And you may have a sense of fullness after just a couple of bites. Fluid around the lungs can make it harder to breathe, too. If you aren’t breathing well, eating can be a challenge. Food isn’t appealing when you can’t catch your breath. If you experience new shortness of breath or worsening of existing breathing issues, call your doctor right away. Another unique side effect of mesothelioma is stiffening of the affected tissues. If you have peritoneal mesothelioma, your stomach and intestines cannot expand properly to accommodate the food you ingested. Even if you have pleural mesothelioma, which is not directly around your midsection, it can affect your ability to eat well. Surgery and radiation therapy may build up scar tissue that can extend into your digestive area, making eating difficult. Because of the way cancer affects your body, you may require more protein and calories than usual to meet basic nutrition needs. If you don’t increase how much you are eating, you may experience unintentional weight loss. Losing weight without trying is hard on your body. It can worsen treatment side effects and make recovery more difficult. Treatment itself may alter the way your body uses the food you eat for fuel, too. Preparing nutritious foods safely is another important part of eating well after a mesothelioma diagnosis. Mesothelioma therapy can make you more susceptible to food poisoning, and food safety is critical to your ability to heal and recover. In addition to a mesothelioma specialist and respiratory specialists, you may want to consult with a dietitian, too. 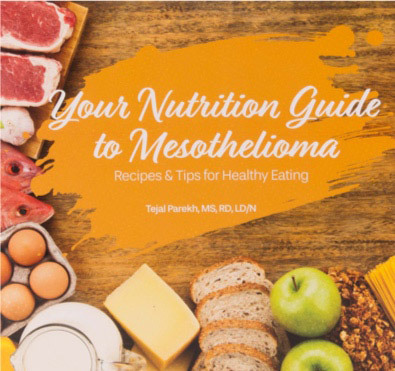 A dietitian can work with you to build an individualized nutrition plan that may ease some of the dietary side effects of mesothelioma. Dietitians can develop protein and calorie goals and provide food lists and menus to help you meet your goals. This will keep you stronger as you go through treatment. Dogan, M. et al. (2014). The clinicopathological characteristics with long-term outcomes in malignant mesothelioma. Med Oncol, 31, 232. DOI: 10.1007/s12032-014-0232-0. Kuo, Y.H. et al. (2018). Prognostic significance of unintentional body weight loss in colon cancer patients. Mol Clin Oncol, 8, 539-543. DOI: 10.3892/mco.2018.1582. Gangadharan, A. (2017). Protein calorie malnutrition, nutritional intervention and personalized cancer care. Loh, K.W. et al. (2012). Unintentional weight loss is the most important indicator of malnutrition among surgical cancer patients. Neth J Med, 70, 3656-9. Mattox, T.W. (2005). Treatment of unintentional weight loss in patients with cancer. Nutr Clin Pract, 20, 400-10.